There's alot of work to be done to bring this beauty back. I can almost guarantee that the renovation will be first class! I think so Fuzz. Not going to be an overnight deal either. 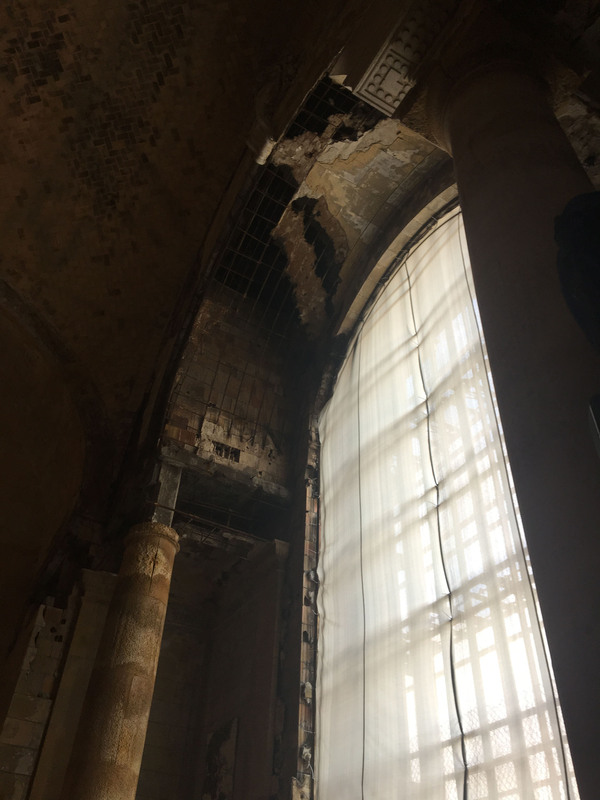 It took years of concentrated vandalism and the ravages of weather to bring the grand old building to it's knees but, I'm sure the Ford Motor Company buyers took a hard look at the structure before they bought it. If I live long enough, I'm really looking forward to viewing the transformation. I understand that the main concourse will be like a mall of sorts with shops and things to do. Only the main building will be offices and part of that will be leased out as well. In as much as the building is on the National register of Historic Buildings, I would think Fords will apply for and get grants and tax abatements on it as well. No matter what, it's a huge undertaking for any corporation. I look for the Maroun family to break ground now on the new bridge. Great pictures, thanks for posting. I saw a brief article somewhere that due to the overwhelming response they were trying to figure out a way to provide access for a couple of more weeks. Not sure how extensive those tours might be though and probably won't last for long if at all. I'll keep my eyes open. I had also wondered if there would be any kind of rail access directly to the 'new' depot. Apparently they haven't ruled that possibility out but it also goes beyond what even Ford can do alone. I can certainly see the potential for something in the future. I was only a few years old and my Mom would take the train from Midland to Stow, Ohio, to visit her sister. I was too small to remember the train depots along the way but looking back I don't see how she could have made the trip without us going through Michigan Central. Later I remember riding the Bee Liner from Midland to Royal Oak to visit another sister. I was a little older so I could really enjoy that trip. The 'Bee Liner' was similar to an interurban car but it was diesel powered. I did some Googling and everything I find indicates the tours have only been extended through Monday. I guess at some point they have to get back to working on the renovation. if you took the train to Stow Oh you probably went thru the little farm towns south of toledo where i grew up.. This would have been in the early 1950s. I don't know what kind of train but do remember the Bee Liner to Royal Oak later on. They may open up the tour to new dates if the demand exists. Passenger trains went out of demand by the mid 50s because most of the people could buy a reliable car by then. Right after WWII there just weren't any vehicles (new or used) to speak of for sale. All the pre-war vehicles had been worn out and a lot of them were scrapped for the 'war effort' so not a lot of 2nd (or 3rd or 4th) hand vehicles around. The big 'three' were busy switching from war production of tanks and planes and 'jeeps' but it wasn't instantaneous. The 'world' our military had destroyed got an awful lot of the same raw materials that we needed to build vehicles. My parents finally bought a new Kaiser Frazer (no idea what model, just a 4 door sedan with a 6 cylinder in line Continental engine with a 3 speed manual transmission and it was painted basic non gloss black. My Mom promptly rolled it over while she was pregnant with me (I've already heard all the jokes possible for that one) and it took months and months to get it repaired. Then they had a '53 Buick 4 door (I think it may have had a straight 8 but I don't remember it being very fast) and then finally in '56 my Dad special 'custom' ordered a 1956 Buick Special (3 holes on the fender). That had a V-8 and a one speed 'DynaFlow' transmission. The neighbor he worked with had a '54 and then a '57 Mercury with V8s and they would race quite often. Anyway, by mid 50s people were all working in the 'post war' boom economy and cars were readily available finally and that really helped put an end to anyone 'needing' to ride the trains. This is not quite the color of his '56. I went along when they ordered it and there were pages and pages of colors available. A lot has changed in building cars since then. Otherwise this looked just like our Buick. The ignition key was just on and off and there was no 'start' button anywhere. You stepped on the gas which would 'trip' the choke and also make a connection to start the engine. It worked great new but later on it caused some issues. Anytime you mix electric and fuel in the same device you'e going to have issues once things get older. The DynaFlow trans also had some problems later on and it was very difficult to find anyone capable of working on it. Finally took it over around Saginaw and a guy that worked on Minneapolis Moline tractors rebuilt it. Maybe tractors had hydrostatic transmissions by then. When they bought the '53 Buick they kept the Kaiser for my Dad's go to work car. The body literally rotted and fell off it in a couple of more years and that was very, very typical for the post war cars. The steel was low grade to start with and they hadn't figured out how to protect it from all the brine they used on our roads around Midland. My Dad worked at Dow and had a small farm operation 'on the side'. We cut the body off the Kaiser and built a 'bed' out of 4" thick oak bridge planks. Put a couple more planks cross wise for a 'seat' and we had a fairly unique farm vehicle. The next door neighbor lady named it 'the doodlebug' and she forbid her kids from being anywhere near it when I was driving it. I started driving it at probably 7 or 8 and never looked back when it came to driving a stick. The day we had drivers training road tests I even took my road test on the one 'stick shift' car we had. Everyone had to have some time driving a stick but most all elected to take their road test on the automatics. I even 'volunteered' to go 'first out of the few of us 'farm kids' that were in that line. I had to slide across the front seat from the passenger door (no bucket seats in those cars). Then the trooper climbed in and said 'go'. I started up and did all the 'safety checks' and then let the clutch out and hit 2nd gear while still in the parking lot. We were a rural school and campus was huge. When I made my 2-3 shift (still in the school drive) the trooper said "You've driven before" and had me pull over. The other 3 or 4 did pretty much the same thing and we had our certificates and were 'gone' before most of the cars had even hit the road yet. 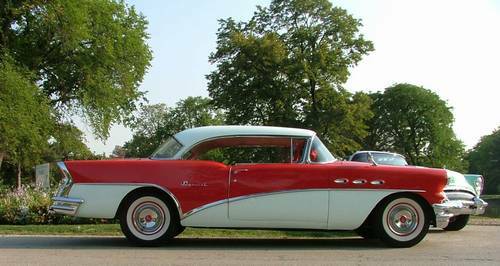 Anyway, here's the '56 Buick. I still prefer a stick shift over an automatic. I'd have a stick in my F350 but Fords hydraulic actuated clutch on their F series trucks also becomes an issue when it gets older so the truck has an automatic. Ford doesn't even sell a manual shift of any combination in the F-150 now. Not sure on the Super Duty. I have GM auto with 5 speed automatic. Also a paddle shifter on column..
Wonder why they bother to add that. Because if it has paddle shifters - its a "race" car.